BLM Prod.-u. Vertriebsges. 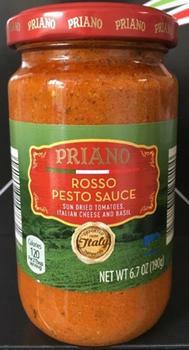 mbH & Co. KG, is recalling Priano Rosso Pesto Sauce that may contain milk and egg, allergens not declared on the label. No illnesses related to this product have been reported to date. The recalled product was packaged in a 6.70-oz. glass jar with a multicolored printed paper label and a twist-off metal lid. The UPC code is 041498147631. The product was sold only by ALDI stores in Arkansas, California, Connecticut, District of Columbia, Delaware, Florida, Georgia, Illinois, Indiana, Iowa, Kansas, Kentucky, Maryland, Massachusetts, Michigan, Missouri, North Carolina, Nebraska, New Hampshire, New Jersey, New York, Ohio, Oklahoma, Pennsylvania, Rhode Island, South Carolina, Tennessee, Texas, Virginia, Vermont and West Virginia. It was also available for purchase to ALDI customers in the Atlanta, Chicago, Dallas and Los Angeles areas through the company's partnership with Instacart, a grocery delivery service. Customers who purchased the recalled product should discard it immediately or return it to their local ALDI store for a full refund. Consumers with questions may contact ALDI customer service at 800-325-7894, Monday – Friday between 9 a.m. and 5 p.m. (CST), or online at aldi.us/customer-service.